Pope Gregorius IX. Decretales. Venice: [Baptista de Tortis], 20 September 1491. 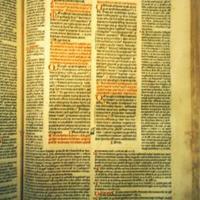 This is an early printed edition of Pope Gregory IX's collected decretals intended for scholastic study and judicial reference. 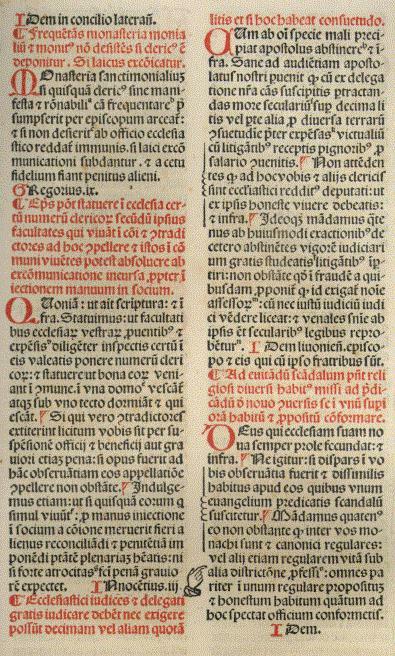 This edition presents the text divided into two distinct areas: the general encyclicals are centered on the page, while specific papal decretals relating to the encyclical surround the center text. 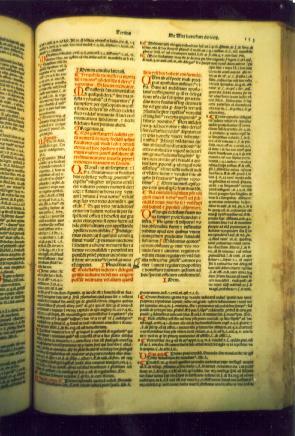 Baptiste de Tortis, who specialized in juridical texts, issued two editions of this work, the first in 1491 and the second in 1494. 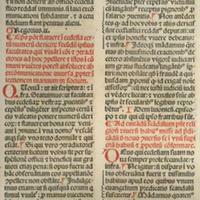 Each edition held 2,300 copies, the largest known press runs of any Venetian printer during the fifteenth century. This edition bears the signature of Georgio Antonio Vespucci dated July 15, 1491 -- two months prior to the publication date of the volume.